V4 Solutions originated in 2008, is an innovative and customer-centric HR Organization who operates with the sole intention of providing a competitive edge to our clients by equipping them with best in class HR Solutions that are cost-effective, time bound and exceptionally personalized to address specific needs and challenges. By virtue of our unparalleled industry know-how and years of experience in HR-related services, we aid our clients with valuable insights that enable them to take well-informed HR decisions. Customer delight is of paramount importance to us and our goal is to transform the existing perception of recruitment being a cumbersome and a lengthy process into a swift and a gratifying one for both our clients and our candidates. Our Motto is “Empowering People, Empowering Partnership” and the Idea is to enroot the preeminent one-stop-shop to meet all the HR engrossments with the primarily convergence on Leadership Hiring, Permanent Hiring, Payroll Solutions, Trainings , Employee Engagement Events and Corporate Gifting Solutions. Every interaction with our clients and candidates is a unique opportunity to cultivate relationships, that is, meaningful and mutually rewarding. Despite the high standards and tight timelines of our demanding industry, we do not resort to unethical practices in an attempt to win brownie points from our existing and prospective customers. We only commit to what we can deliver and ensure full transparency between our clients and candidates in order to avoid any expectation mismatch at a later stage. To ensure the long-term success of our clients, we only source the best candidates with the right attitude. Likewise, we leave no stones unturned to find the right matches for ambitious job aspirants who seek our placement services to bag fulfilling roles in their chosen fields. We truly believe and advocate the need to keep your personal information private and exclusive to you. You can be rest assured that any information that has been disclosed to us in good faith will always be honoured and kept safe and secure. There is no formula to success in business. What works for your brand today may not work tomorrow. Then what does it take to start up? A Fresh Idea? An Enthusiastic team? Lot of Money? Yes, All of these. addressed, and that the solution is something which your consumer may want. 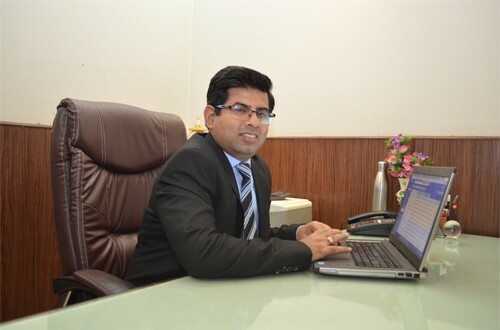 The Idea of becoming a top-notch Provider of Talent Management Solutions first germinated in the mind of the promising entrepreneur, Mr. Sandeep Arora who were observant of the growing needs of the Recruitment Industry and wanted to harness the untapped potential in the realm of HR and Recruitment. Founded in 2008, V4 Solutions had a modest start to begin with and provisioned the manpower needs of Manufacturing Sector. By the year 2010 with the expert guidance of the Advisory Team and determined Recruitment Team V4 Solutions succeeded to be the Recruitment Partner to around 30 Consumer and FMCG Brands Nationally. Since then the company has never turned back and kept on adding value to the services and succeeded to empower partnerships with both Clients and Candidates. It was the efforts of the enthusiastic team and trust of the retained clients that the company commenced the Office in New Delhi and entered a totally new phase of becoming a Domain Specialized Recruitment Services Provider in 2014. Today, V4 Solutions is a team of Account Managers Pan India who supports the Geographic Hiring Needs and A Great Domain Specialized Internal Recruitment Team with more than 100 Clients in the ever-increasing Client Base. V4 Solutions passionate journey has empowered it as a trusted name for hiring needs at middle and senior level positions and we are crowned to acknowledge that more than 80% of the company’s revenue is generated from the retained partnerships with our happy customers. With the years of successful services in Leadership Hiring, Permanent Hiring and RPO Services, V4 Solutions is now progressive to establish a preeminent one-stop-shop to meet all the HR engrossments namely Payroll, Corporate Trainings, HR Events, Corporate Gifting Solutions and Resume Builder services.